2018 Heritage Days Event and Hatsan Mod 95 Combo Door Prize - Indiana Airguns! What happens when Indiana Airguns puts small bore airguns, big bore airguns, and thousands of people who are unfamiliar with modern adult PCP air guns all in the same place? If you were inside the IndianaAirguns.com booth at the 43rd annual (2018) Frankton Heritage Days when it happened, you answered a ton of questions and exchanged a bunch of smiles. Heads were shaken in disbelief and eyes lit up in wonder as experienced and novice shooters got a up close look at a Hatsan Flash QE, a Hatsan Hercules Bully big bore, and a Brocock Bantam Sniper HR among the PCP air guns in the booth. 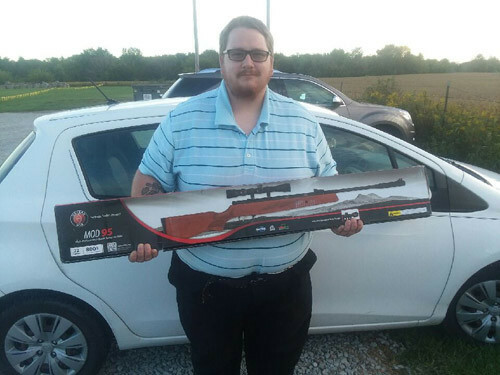 It was a very cool weekend that ended with Terry Thompson of Frankton, Indiana winning a new Hatsan Mod 95 Combo courtesy of HatsanUSA. It almost did not happen. The small town of Frankton, Indiana has held a town festival for 43 years, it draws 3-5000 people a year for family fun and great food. It takes all year to plan with dozens of vendors, helicopter rides, chainsaw carving, a parade, entertainment and transportation all planned out to the last detail. Clowns and jugglers and bagpipers and magicians set to provide pop up entertainment as the crowd munches on elephant ears, snow cones walleye tacos and all the other fair food while walking through the booths and carnival rides…and then it rained…and kept raining…over six inches the weekend before the festival. The traditional festival location found it’s self under the hip deep flooding of Pipe Creek spilling it’s banks. What happened next was amazing. We did what a tight knit farming community does, we pulled together and pulled it off. A new location was found at the Girls Softball field, miles of electrical wire was strung along with water lines run to support the food vendors. Shuttle routes were changed, deliveries rerouted and permission given for parking and extra vendor space from the new site’s neighbors. Locals came from every corner of town to do whatever it took to make sure that the festival not only happened, but grew and thrived at the same time. IndianAirguns.com was on a corner, by the chainsaw carver, down from the pony rides and petting zoo. We talked airguns, made appointments to shoot airguns, showed what modern springers and PCPs are all about, took registrations to win the Hatsan Mod 95 that HatsanUSA was happy to donate as a door prize. We spoke to shooters of all ages and made many new friends. Terry Thompson of Frankton, Indiana won the giveaway. Terry is a hard working family man who coaches his daughter’s softball team. He plans to bring that sweet walnut stocked springer to the IndianAirguns.com range for some fun. Indiana Airguns is proud to have been a small part of the 43rd annual Frankton Heritage Days festival.